Reflecto-Lite's shimmering mirrored discs catch all natural or projected light and throw back a magnified sparkle of brilliantly multicolored highlights in random patterns. REFLECTO-LITE is a metallized faceted plastic octagonal disc attached to individual pegs on a backing strip. It is supplied in one foot lengths and comes assembled and ready for use. It may be snipped to suit any job need : circles, squares, rectangles, triangles, contour outlines or unusual shapes and designs. Reflecto-lite can be stapled onto wood or any surface which staples can penetrate. Be sure to use rust-proof (stainless steel) 3/8 inch staples for outdoor applications. Stapling is the fastest and most cost efficient way of installing Reflecto-lite. With a power staple gun, 80 to 120 lineal feet of Reflecto-lite can be installed in one hour. Reflecto-Lite is equally effective indoors. Air-conditioning or a fan is usually sufficient to activate Reflecto-Lite. Ideal for store windows, suspended flyers, counter teasers and interior accenting's. Reflecto-Lite is supplied in one foot lengths. It comes assembled and ready for use. It may be cut to size to suit any job need; circles, squares, rectangles, triangles, contour outlines or any unusual shapes and designs. Reflecto-Lite is easy to install; it may be attached to any type of surface - wood, foam, plastic - by staples, tape or glue. In the 7/8" size, 12 lineal feet will cover one square foot, while in the 1-1/2" size the same area can be covered by 7 lineal feet. 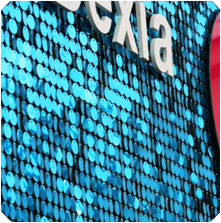 The more surface area that is covered in Reflecto-Lite the more effective the sign becomes.